Tourists of the 19th century had Ferris Wheels to freak themselves out. The 20th century had bungee jumping and skydiving. 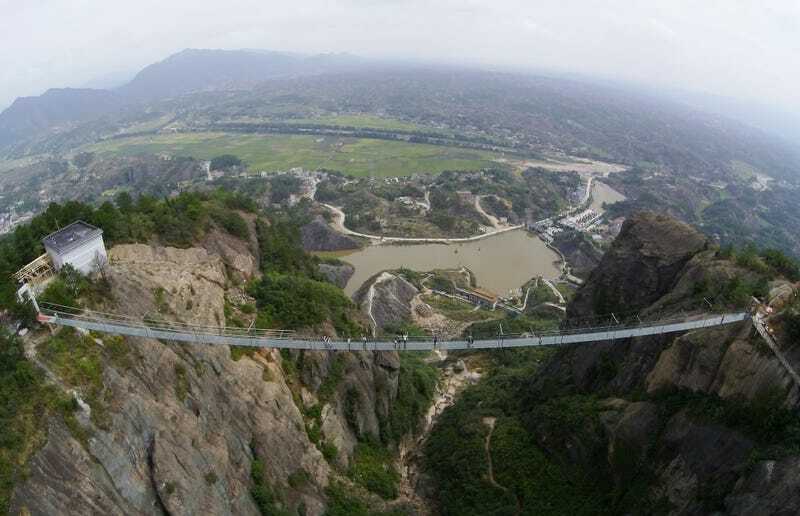 Today, cities in the US, China, and Canada are building permanent glass “skywalks,” the longest of which—a 984-foot monster—just opened in Hunan province, China. Hunan is home to some of the country’s most amazing geology and plenty of adventure tourism, thanks to its UNESCO-protected warrens of massive sandstone pillars, complex caves, and forests. It’s been a big tourism magnet for a long time, but over the past two years it’s become a hotspot for a new form of “adventure:” The glass skywalk. Skywalks, where a series of strong glass panels are suspended or cantilevered out over a tall cliff or building, are popular everywhere right now: One opened in Canada some 900 feet above a glacier in Jasper National Park in 2011. Chicago installed a glass deck over the edge of the 103rd floor of the Willis Tower in 2009. The Grand Canyon has one too, a curving steel-rimmed U-shape that juts out over the main canyon, which opened in 2007. But China is definitely the leader in this category, and many of its skywalks are being built in Hunan, where tourists visiting its geological wonders are rife. The Grand Canyon skywalk by AP Photo/Ross D. Franklin. Bottom: Jasper National Park skywalk by Stephanie Payne/Flickr. The latest of these opened last week in Shiniuzhai, a geology park about an hour outside of Changsha. There, an almost 980-foot-long wood and steel footbridge has spanned a valley there for years. But last year, perhaps in order to compete with high-profile glass skywalks elsewhere in Hunan, several of its wooden slats were replaced with inch-thick structural glass. Over the past few months, the park has replaced all of the wood panels with glass, opening the full glass version of the footbridge on Thursday, according to the Independent. Visitors took selfies and scrambling across the glass in press photos. Its length makes it the longest such bridge in existence, though it’s got plenty of competition amongst skywalks. In April, a glass cantilever structure, jutting out above 2,300-foot-high cliffs, opened in Longgang, in Shenzhen. And in May, another Hunan geological site, Zhangjiajie National Forest Park, opened a 2oo-foot-long glass skywalk that’s cantilevered off of the edge of a mountain almost 5,000 feet above the ground. The results confirm that facing fear or challenge, leading to being intrinsically rewarded, is a main motivator. However, the aspect of fun is still fundamentally important to each activity. The youth traveller market is generally extremely responsive to viral marketing, which (through wording and visuals) creates an image of a “life‐changing experience”, “thrilling adventure”, and similar. Skywalks provide the “fear” as well as the Instagram bragging rights, but in bite-sized and relatively low-time-investment way. The technology has quickly progressed to a point where it’s feasible to build a skywalk for relatively low costs. In fact, the biggest liability is usually the shoes of visitors–which leave scuffs, smears, and scratches in the glass. In 2011, the Grand Canyon’s 46 panels had to be replaced completely. There are other ways to fight scratching, though they’re not perfect either. At Chicago’s Skydeck, engineers spec’d a thin layer of scratch-proof glass atop the structural panels, designed to be replaced every few months. But last year, the thin cosmetic glass cracked while visitors stood on it, scaring the bejesus out of a group posing for a photo.